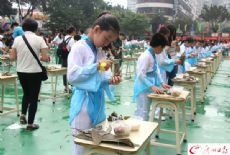 A zongzi-making party was held by a Guangzhou primary school on May 23 to celebrate the upcoming Dragon Boat Festival. More than 1,000 students and their parents participated in the event, according to the organizer. Zongzi, usually pyramid-shaped steamed glutinous rice packages in bamboo or reed leaves, are widely consumed during the traditional Chinese festival, which falls on May 30 this year. Parents were encouraged to take part in the activity together with their children. Put the glutinous rice on the fresh and fragrant bamboo leaves, then fill in with ingredients such as red date, pork or salted egg yolk, and fold the leaves around the rice and fillings and secure with twine. The last step is the trickiest part for most students and even parents. "I am not good at making zongzi," a woman said, "but I am very happy having a good time with my child and celebrating the festival together." The do-it-yourself (DIY) activity helped create a happy family time and better the kids' knowledge of the cultural meaning of the festival.